If you are looking for a scrumptious refrigerator dessert for that special occasion, you won't be disappointed with this one. Combine melted butter and crumbs. Press on bottom of 9-inch spring form pan. Mix gelatin powders together in a bowl. Add boiling water and stir to dissolve. Mix in partially thawed strawberries. Chill until syrupy. Beat cream cheese and icing sugar together until smooth. Whip cream until stiff. Fold into cream cheese mixture. Fold in thickened strawberry jello mixture. 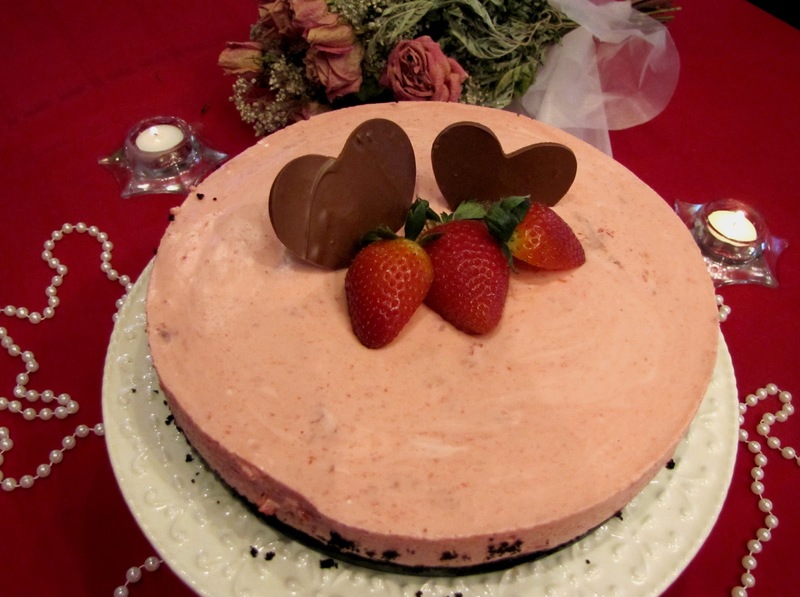 Garnish with chocolate curls or hearts and fresh strawberries, if desired. How pretty! I will give this a try sometime very soon. I think I have all the ingredients. Oh so lovely looking Judy. Love the color and the added chocolate hearts! Great dessert for Valentine's Day. Chocolate and strawberries..you can't go wrong! I wonder if you could make this in summer with mashed fresh berries. . .or raspberries. I made this today, but used raspberries instead of strawberries cuz thats what I had in the freezer, and it was a hit! Absolutely delicious!